The 68MW Ferrybridge Multifuel 1 (FM1) power plant was fully-commissioned in July 2015. Image: courtesy of Wheelabrator Technologies. FM1 is owned and operated by Multifuel Energy, a 50:50 joint venture (JV) between SSE and Wheelabrator Technologies. Image: courtesy of Powerday. Ferrybridge Multifuel 1 (FM1) generated 50 full-time jobs. Image: courtesy of Wheelabrator Technologies. Ferrybridge Multifuel 1 (FM1) is a multi-fuel power station located on a 16.2ha site adjacent to the existing Ferrybridge C Power Station near Knottingley, West Yorkshire, UK. The 68MW power plant was fully commissioned in July 2015. The facility is owned and operated by Multifuel Energy, a 50:50 joint venture (JV) between SSE and Wheelabrator Technologies. The power output from the plant is purchased by SSE. The Department of Energy and Climate Change (DECC) approved the project in October 2011, construction works were initiated in late 2012 and the plant was connected to the grid in June 2015. 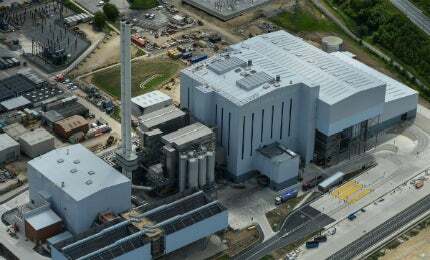 The electricity generated by the FM1 waste-to-energy plant is sufficient to power approximately 160,000 homes. The project also generated 500 construction jobs and 46 full-time jobs. The total investment on the plant was £300m ($460m). Emissions-reduction company 2Co Energy is developing a 650MW integrated gasification combined-cycle (IGCC) coal-fired power plant in Stainforth, Doncaster, South Yorkshire. The major components of the power plant include a waste receiving and storage area, integrating a 57,600m³ enclosed solid fuel bunker, combustion and boiler facilities, flue gas treatment facilities, and residue handling and treatment facilities. The power plant has two 117MW, five-pass boiler lines, which burned solid fuel for the first time in May 2015. The combustion system integrates an AR123-120120 type grate, integrating four rows with six zones a row, which can be cooled using air or water. The fuel is burned under controlled conditions to produce steam using the two boilers. The steam is fed to an extraction-condensation turbine to generate electricity. Excess steam is used for heating purposes within the plant. Flue gas derived from the power plant is treated using the DeNOx technology through the selective non-catalytic reduction (SNCR) method and released into the atmosphere through an 80m stack. The recovered bottom ash is treated offsite. The renewable power plant will use approximately 570,000t a year of fuel derived from waste to produce low-carbon electricity. The fuel is supplied from the Yorkshire region, particularly from Barnsley, Rotherham, Doncaster and Cumbria. Approximately 200,000t of waste-derived fuel a year will be supplied from mechanical biological treatment plants owned by Shanks in these regions after being processed at a facility in Wakefield to remove recyclable materials. The first delivery of fuel by Shanks was made in March 2015. The fuel is produced from materials such as municipal solid waste, commercial and industrial waste, and waste wood and delivered to the power station by road or rail. Another major supplier of fuel for the power plant is Powerday. "The renewable power plant will use approximately 570,000t a year of fuel derived from waste to produce low-carbon electricity." Hitachi Zosen Inova (HZI) served as the general contractor for the project. John Sisk & Sons was subcontracted to perform the concrete sub-structure and super-structure works for the project in collaboration with Cidon. Race Cottam Associates was appointed as the architect for the project. Rainham Industrial Services (RIS) performed the insulation works, whereas Rockwool Technical Insulation supplied the ProRox PS 971 UK pipe sections used for the insulation of pipework. Distributed control systems (DCS), including a dynamic network of applications (DNA) DCS, an integrated safety system and an information activity server for the power plant were supplied by Metso. Ultimate Communications Systems supplied, installed, tested and commissioned the entire communications systems. The waste bunker was constructed by Slipform Structures. Soil stabilisation works at the project site were performed by TR Stabilisation, while the removal of oil-filled 132KV cables from the site to facilitate the construction was performed by Gilmerton Land Services (GLS). Environmental impact assessment (EIA) for the project was performed by URS Corporation. Health and safety management services were provided by Safety Management Services Europe (SMSE). Independent auditing services were provided by Baker Mallett. LSM Multiservices Ltd is a specialist contractor for the thermal insulation of pipe work and tanks, (both domestic and industrial), asbestos removal and sheet metal fabrication. The Harris Pye Group is a global company specialising in industrial, offshore oil and gas, and marine sectors. Operating worldwide, our emphasis is on cost-effective repair, preventative maintenance and conversion work.